During May 1940, with a German invasion a very real prospect, the War Office set up the Directorate of Fortifications and Works, Branch 3 (FW3) under Major-General GBO Taylor whose remit was to design a range of defensive structures - hardened field defences or 'pillboxes' - that would be suitable for construction by the army and/or civilian contractors. 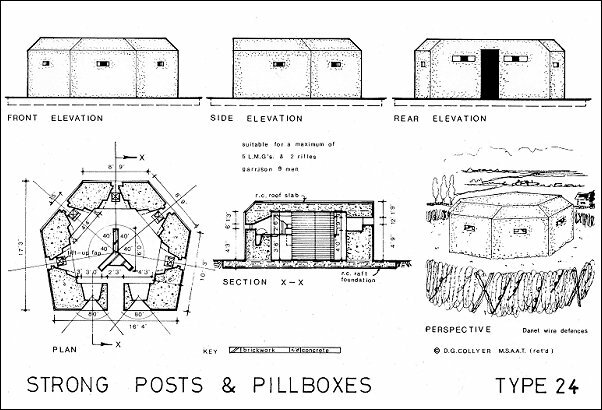 Within a few weeks six designs for pillboxes, designated Types 22 through 27, had been produced that would form the basis on which most pillboxes would be built, (albeit with a good range of local variations and local 'one-offs'), as well as designs for a Vickers medium machine gun emplacement, 2-pounder and 6-pounder gun emplacements plus ancillary structures such as observation posts, searchlight batteries, and so on. Today, Yeovil's sole remaining pillbox, photographed below, appears to be a lonely sentinel in the corners of a field - a reminder of a time when Britain faced its darkest hours. Seeing it in isolation it is, perhaps, tempting to think that pillboxes were placed in the landscape with little apparent thought to their location. In fact the very opposite is the case since the greatest care was not only placed on their siting, but much emphasis was placed on how they interacted with each other to form a complete defensive system that relied on the inter-relationships between their constituent parts to create an effective whole. The wartime defences of Yeovil were part of the Southern Command Home Defence Programme 1940 which was primarily concerned with 'stop lines' - lines of defences designed to split up the countryside and slow down an enemy invasion until an army central reserve could be brought to action. Although Yeovil was at the very end of two proposed stop lines; the first running south of Sherborne and then north around Stalbridge before turning southeast to Blandford while the second ran south and east towards Dorchester then on to Wareham. Very little of these stop lines were actually built although there are quite a few pillboxes, etc. around Maiden Newton and the only fully functional local stop line was the Taunton Stop Line which ran from Pawlett on the north Somerset coast, then via Bridgwater, Ilminster, Chard and Axminster to Seaton on the Devon coast. Yeovil had a mere three or four pillboxes only one of which survives. This is on the crest of the rear, or southern, slope of Summerhouse Hill and is photographed below. 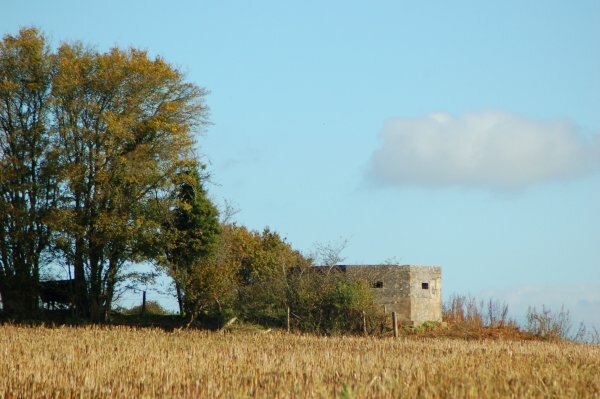 Yeovil's pillboxes were almost certainly constructed in the summer of 1940 as part of two intended stop lines and were later incorporated into the Yeovil Anti-Tank Island garrisoned by the Yeovil Borough Company, 3rd Somerset (Yeovil) Battalion Home Guard. It was later incorporated into a 'defended locality' on Summerhouse Hill. 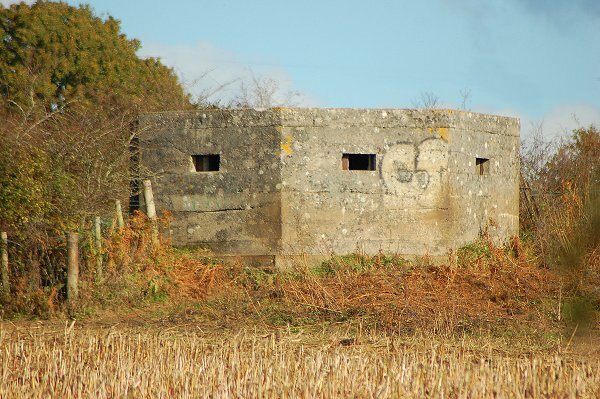 It is a shellproof, thick-walled Type 24 pillbox and survives in good condition. A second pillbox, photographed above left, was close to Houndstone Corner but was destroyed for housing and the site is now at the end of Heather Way. It appears from the photograph to have been a Type 24 as detailed below and would undoubtedly have been connected with Houndstone Camp rather than any stop lines or the Yeovil Anti-Tank Island. There was rumoured to be another actually in the Westlands site, but details are scant. There was a shellproof, thick walled Type 24 pillbox on the western side of the road at the top of Hendford Hill, some 50 yards northeast of the Quicksilver Mail. This was clearly intended to defend the road junction with the A37 and A30 at the top of Hendford Hill and was incorporated into the defense of a road block at this location. 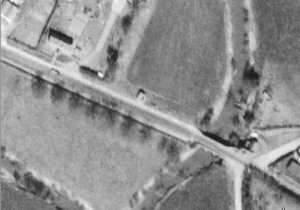 The final Yeovil pillbox seen at the centre of the 1946 aerial photograph was another Type 24 pillbox and was built to defend Yeovil Bridge and was incorporated into the defense of a road block at this location. In the photograph Sherborne Road runs from top left to bottom right, the river Yeo snakes from top right to bottom centre with the bridge at lower right. All the FW3 designs for infantry pillboxes were designed with embrasures suitable for Bren light machine guns as well as rifles. However in 1940 and even in 1941 Bren guns were in extremely short supply and defence troops were not high on the supply list. The supply to the Home Guard was even worse and even my dad's Home Guard platoon at the Royal Small Arms Factory at Enfield Lock, the only place where Bren guns were manufactured at this time, had considerable trouble getting one. RSAF Enfield, by September 1939, were manufacturing 400 Bren guns a week and by June 1940 more than 30,000 had been produced and issued. After Dunkirk only some 2,300 Bren guns remained in England and RSAF Enfield worked flat out to produce more. By 1943 production at Enfield had reached 1,000 guns per week but nevertheless, even later in the war when armaments became more available, Bren guns were not numerous, especially in the Home Guard; for instance Somerset's Mendip Company of Home Guard deployed 7 officers, 132 men, 57 rifles, 17 EY grenade launchers, 45 Sten guns, 1 Bren Light Machine Gun, 3 Browning Automatic Rifles, 3 Lewis guns, 4 Northover Projectors and 3 Spigot Mortars and, at its peak, Somerset's Charterhouse Home Guard unit mustered an officer and 36 soldiers armed with a Bren gun, 9 Stens, 21 rifles and 2 EY grenade launchers. To complicate matters further, during these times of severe shortage, other light machine guns were pressed into service, for instance, the Hotchkiss Mark I and the Browning light machine gun. Yeovil Borough Company had a mix of Lewis guns, Sten guns, rifles and a Northover Projector. It must be stressed that the FW3 designs were intended as basic concept designs and all were frequently modified due to local terrain conditions, availability of materials, supplies of prefabricated components such as lintols or embrasures, competence and availability of local labour, and so forth. An example of variation is demonstrated by the materials used for shuttering the structure; the most economical shuttering was pre-formed timber shuttering that could be erected quickly and removed quickly after the concrete had set in order for it to be re-used at the next pillbox. As well as speed of erection, this also ensured a large degree of conformity to design. The main problem, of course, is that during 1940 timber was in extremely short supply which forced the use of other materials for internal and external shuttering such as brickwork, concrete blockwork and breeze blocks all of which were invariably left in place. The steel reinforcement used in the construction of pillboxes appears to be quite consistent where it is visible, with ½" or ¾" (12mm or 19mm) almost invariably used. Certainly the use of old bedsteads and metal garden railings used as reinforcement seems to be apocryphal. In fact reinforcing rods are frequently seen because they were often placed too close to the outer edge of the concrete, causing the thin outside layer of concrete to spall and expose the reinforcement - probably a sign of wartime hurried construction or the lack of properly trained labour caused by the wartime labour shortage. Having said that, although it is obvious that great pride was taken in the construction of most pillboxes and other defences, their working lifetime was expected to be brief and the fact that today, seventy years after their construction, the condition of most of those surviving is very good indeed is a real testament to the workmanship of the civilian contractors and sub-contractors. 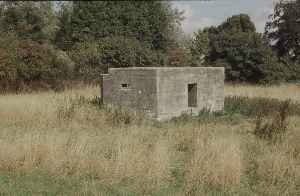 Foundations for a typical bulletproof pillbox would be about two feet (600mm) wide, 9" (225mm) thick and about three feet (0.91m) deep. The floor slab was 6" (150mm) thick but increased to about 12" (300mm) beneath the central anti-ricochet wall which also supported the 12" (300mm) thick reinforced concrete roof slab. All dimensions were increased appropriately for pillboxes constructed to shellproof thick-wall standards. The internal and external shuttering would be built to the height of the embrasure cills and the steel reinforcement cage constructed. The concrete for the walls was usually poured to embrasure cill height, then the remaining wall reinforcement and the complex shuttering around the splayed embrasures would be fabricated before the second 'pour' of concrete completed the walls. The horizontal join at embrasure cill level of the two concrete 'pours' is often seen as a mark in the concrete as in the photo at left. In the meantime the internal anti-ricochet wall would be constructed to roof level and, finally, shuttering and reinforcement would be installed for the roof slab. 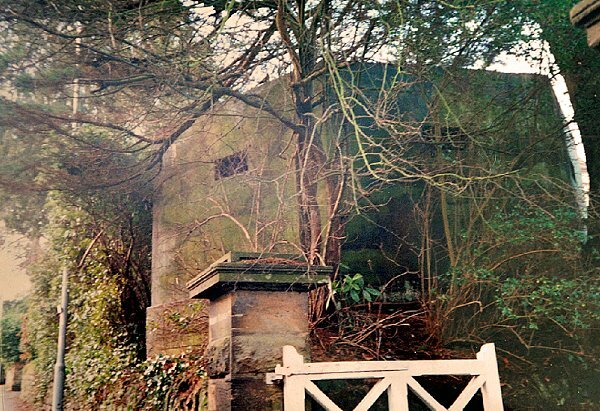 The Hendford Hill Type 22 shellproof pillbox, now demolished. Yeovil's sole surviving pillbox sitting on the skyline, but in 1940 it would have been completely camouflaged and all but invisible to the casual onlooker. A closer view of Yeovil's Type 24 shellproof pillbox. Original construction drawings by the Directorate of Fortifications and Works, Branch 3 (FW3) of a shellproof Type 24 pillbox, now at the National Records Office, Swindon.